A bit of history about everyone's favorite rice wine. And a couple things you may not know about it! If there is any alcoholic beverage more misunderstood that Sake, I know not what it is. And, I speak from experience. The first time I had it, undoubtedly in a Japanese restaurant many years ago, was the last (I likened it to rubbing alcohol, which I admit I haven't tasted), until recently, when I spotted a variety of sakes (at a variety of prices) in a local Japanese market. I had driven by it for years and my decision to take a look not only revealed a plethora of wonderful foods, but allowed me to discover the pleasure of a long-disdained drink. The cool news: These high-end sakes are meant to be drunk over ice, or at least chilled. Depending on what you get (tasting several is the only way to go, since each of you will taste them differently), some actually have a creamy quality. Whatever you do, savor each one…they are full of surprises. Now, surely, to each his own. Millions of people drink "restaurant" sake and like it just fine. But trust me on this: If you like that, you're going to love the fine sakes available and, if you don't, you are in for a treat. In fact, sake aficionados will tell you that it's actually a spiritual experience to drink sake, that they get an emotional lift from it, not to mention energy from the nutrients that do wonderful things for the human heart and imagination. Simply put (which is impossible, because there's lots to know about, but I'll try), sakes are wines made from rice and water and while various sources say "it's the rice" (anywhere from twenty eight to more than sixty varieties of rice cultivated are ideal for sake production, depending on the source) it really is a combination of the skill of the brewer, the source of the water as well as the type of rice used that will determine the final quality and taste. Generally speaking, there are four types of sake categorized by how polished the rice is and whether grain alcohol has been added. Junmai-shu is made from rice and water only. Honjozo-shu is made from rice, water and a small amount of distilled alcohol for lightness and dryness and more fragrance. Ginjo-shu is a more highly milled rice and may be made with or without alcohol. 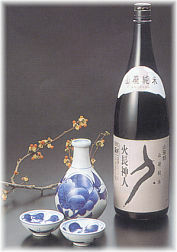 Daiginjo-shu is made with an even more highly milled rice and with or without alcohol. What differentiates the milling is the percentage of the grain that is removed. The more skin and protein removed (about 20 percent is taken away for table rice), the purer the starch content and the finer the sake will be. At the very least, thirty percent is milled away and, for the premium wines, forty percent. As much as sixty five percent may be milled away for truly superior sakes. Junmai-shu is milled thirty percent, Ginjo-shu forty percent, Daiginjo-shu from fifty to sixty five percent. Hard water with high mineral content yields a fuller sake, soft water a fresher, cleaner tasting brew. And, unlike grape-based wines, it needs to "balance" only six months before drinking. In fact, sakes are best when fresh (soon after release) and shouldn't be kept for more than a week or so after being opened. Sake requires a double chemical process, first turning the rice starch to sugar (saccharification), then turning the sugar to alcohol (fermentation), using enzymes in the air and water versus chemical additives used by some wine and beer makers to complete their processes. The history of sake begins in Japan, of course, then moves to Hawaii where Japanese countrymen were recruited to work in the sugar cane fields. About fifteen breweries were built in California at the beginning of the twentieth century, but all have disappeared since World War II. Later, around 1977, Japanese brewers began setting up shop in California and today some of Japans biggest operations have U.S. breweries which produce about two million gallons a year. Now, the race is on to produce a superior American-made wine. From a dining standpoint, while you may serve a different grape-based wine to complement each course, when you serve sake, it's the star, and the food is varied to complement the wine. And, with the now long-standing trend in low-fat eating, it's a perfect accompaniment to pasta, seafood and, of course, anything Thai, Chinese or Vietnamese as well as Japanese.